The strange thing about strangers is that they are unknown and known. There is a pattern to her, a shape I understand, a private geometry that numbers mine. She is a maze where I got lost years ago, and now find the way out. She is the missing map. She is the place that I am. She is a stranger. She is the strange that I am beginning to love. Love…maybe it’s a recognition, perhaps discovery, sometimes it’s sacrifice, always it’s treasure. It’s a journey on foot to another place. Truth tell, anywhere is a life, once there is a love. Love without thought. Love without conditions. Love without promises. Love without threats. Love without fear. Love without limits. Love without end. Loneliness is about finding a landing-place, or not, and knowing that, whatever you do, you can go back there. The opposite of loneliness isn’t company, it’s return. A place to return. Far out, too far to see with the human eye or to hear with the human ear, is everything we have lost. We add to that loss feelings that are unbearable. Send them out into deep space, where we hope they will never touch us. Sometimes, in our dreams, we see our little world, never could rocket them away far enough, never could get rid of them for ever. We were each other’s conquered land. We were matched in power and helplessness. We were the barter and the prize, what we played for, what we lost. I disappear into the person I love. I am the permeable membrane. Virginia Woolf: Across the broad continent of a woman’s life falls the shadow of a sword. On one side of that sword, she said, there lies convention & tradition & order, where ‘all is correct.’ But on the other side of that sword, if you’re crazy enough to cross it and choose a life that doe not follow convention, ‘all is confusion. Nothing follows a regular course.’ Her argument was that the crossing of the shadow of the sword may bring a far more interesting existence to a woman, but you can bet it will also be more perilous. People think a soul mate is your perfect fit, and that’s what everyone wants. But a true soul mate is a mirror, the person who shows you everything that’s holding you back, the person who brings you to your own attention so you can change your life. A true soulmate is probably the most impt person you’ll ever meet, because they tear down your walls and smack you awake. But to live with a soulmate forever? Nah. Too painful. Soul mates, they come into your life just to reveal another layer of yourself to you, and then they leave. Life, if you keep chasing it so hard, will drive you to death. Time–when pursued like a bandit—will behave like one. The search for God is a reversal of the normal, mundane worldly order. In the search for God, you revert from what attracts you & swim toward that which is difficult. You abandon your comforting and familiar habits with the hope (the mere hope) that something greater will be offered you in return for what you’ve given up. Every religion in the world operates on the same common understandings of what it means to be a good disciple—get up early and pray to your God, hone your virtues, be a good neighbor, repsect yourself and others, master your cravings. Devotion is a diligence without assurance. Faith is a way of saying, “Yes, I pre-accept the terms of the universe and I embrace in advance what I am presently incapable of understanding.” There’s a reason we refer to “leaps of faith”—because the decision to consent to any notion of divinity is a mighty jump from the rational over to the unknowable. Faith is belief in what you cannot see or prove or touch. Faith is walking face-first and full-speed into the dark. Life’s metaphors are God’s instructions. You have just climbed up and above the roof. There is nothing between you and the Infinite. Now, let go. The day is ending. It’s time for something that was beautiful to turn into something else that is beautiful. Now, let go. Your wish for resolution was a prayer. Your being here is God’s response. Let go, and watch the stars come out—on the outside and on the inside. With all your heart, ask for grace, and let go. With all your heart, forgive him, forgive yourself, and let him go. Let your intention be freedom from useless suffering. Then, let go. Watch the heat of day pass into the cool night. Let go. This is what rituals are for. We do spiritual ceremonies as human beings in order to create a safe resting place for our most complicated feelings of joy or trauma, so that we don’t have to haul those feelings around with us forever, weighing us down. We all need such places of ritual safekeeping. And I do believe that if your culture or tradition doesn’t have the specific ritual you’re craving, then you are absolutely permitted to make up a ceremony of your own devising, fixing your own broken-down emotional systems with all the do-it-yourself resourcefulness of a generous plumber/poet. If you bring the right earnestness to your homemade ceremony, God will provide the grace. And that is why we need God. I think you have every right to cherry-pick when it comes to moving your spirit and finding peace in God. I think yu are free to search for any metaphor whatsoever which will take you across the worldly divide whenever you need to be transported or comforted. It’s the history of mankind’s search for holiness. You take whatever works from wherever you can find it, and you keep moving towards the light. Happiness is the consequence of personal effort. You fight for it, strive for it, insist upon it, and sometimes travel around the world looking for it. You have to participate relentlessly in the manifestations of your own blessings. And once you have achieved a state of happiness, you must never become lax about maintaining it, you must make a mighty effort to keep swimming upward into that happiness forever, to stay afloat on top of it. If not, you will leak away your contentment. It’s easy enough to pray when you’re in distress but continuing to pray even when your crisis has passed is like a sealing process, helping your soul hold tight to its good attainments. 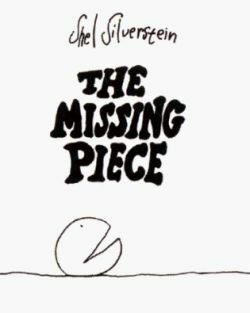 This is the first Murakami book I ever finished. The first book I bought was Kafka on the Shore which I failed to finish. Gifted to me by a faculty/colleague, I knew he was the kind who ‘paired’ his gifts to the receiver, so reading this got me wondering: ‘What was Sir Eddieboy thinking when he gave me this? It’s weird!’ Bwahaha. 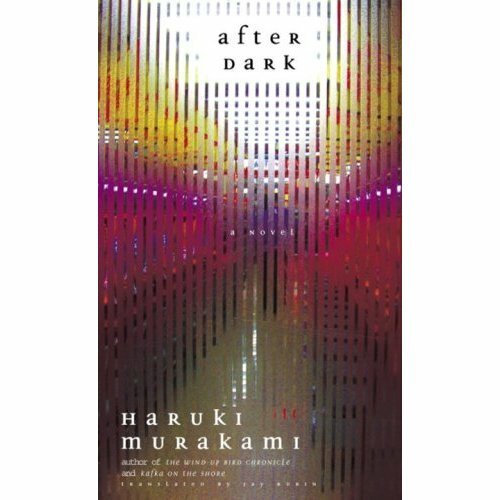 The Ring kept popping in my head in the television scenes in this short fictional novel, and Mari & Takahashi are interesting characters enough to float my curiosity. The ending is left hanging, so I’m wondering if Mari ever woke up from her deep sleep. Is sleep metaphorical for dying? Her sister Eri never woke up. Hmm. Depending on what the desires and needs of the reader are, this book will make you think if you’re trying to hard to fit into a job, a love, or a life you’re living. I think I thought of all of the ones I mentioned. This book is morbidly funny, but it disturbed me a bit because my family has had 3 (or four) rabbits as pets in our lifetime. 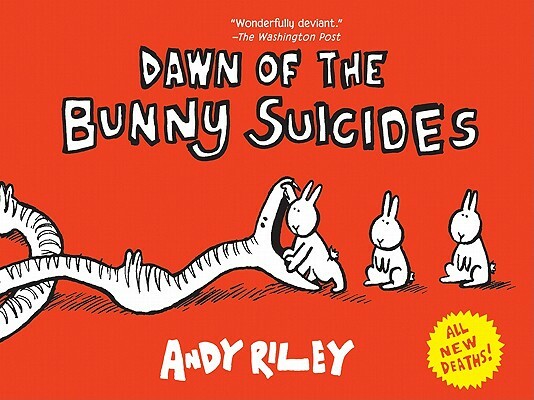 Do bunnies really have suicidal tendencies? Why?! Haha. Loved the movie references of the comics. Though hope is frail, it’s hard to kill. 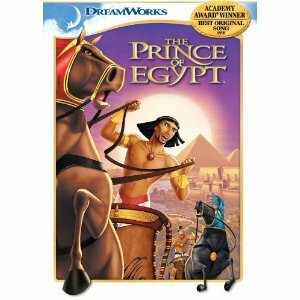 It is Good Friday as of this writing, and it’s timely for me to watch The Prince of Egypt again (for the nth time). 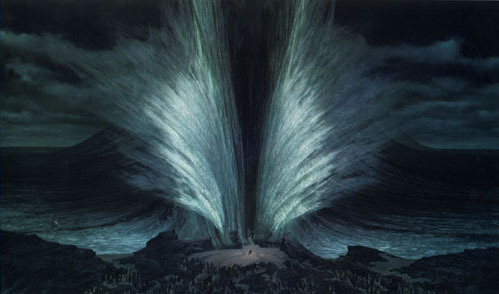 I recently bought the original dvd (which was on sale) to see the bonus features/behind the scenes of the disc, most especially to see how they made the digital effects for the parting of the Red Sea. I was not disappointed with my purchase. This has got to be, in my humble opinion, the BEST piece of work that Dreamworks Studio (and probably Steven Spielberg) ever made, as it is the collaboration of some of the best artists of both traditional and digital animation. To make the visual experience richer, Academy Award winning composers and actors provide the vocal drama. This film is epic in its scope and depth, because the spiritual experience is grand, mysterious, and metaphysical in nature. Few people dare pursue such projects to avoid becoming preachy or didactic, and few projects as such succeed in gathering audiences without criticism. In my lifetime, memorable are Charleston Heston’s Ten Commandments, the anime shows Flying House, and Superbook. How can Biblical passages be translated into contemporary, inspirational media that could change this already skeptic, rational world we live in? Dreamworks found a way to do that, with years of hard work on this picture. How can you not love this cast? The song was awarded Best Original song in the Oscars, and the popular divas Mariah Carey and the late Whitney Houston just helped widen the reach of this inspirational song mainstream. Put these factors altogether and it becomes one of the best Bible story adaptations of all time. Here, the story of Moses finding his faith is rooted in his personal struggles to go against his beloved brother, but the greater good is at stake. 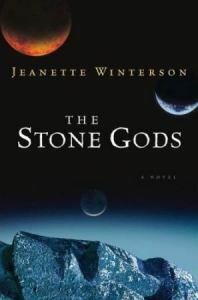 His people rely on him for salvation, but first he had to find who he really was, where he came from, what his role as chosen one entails him to do. Believers of other religions may not agree with the themes of The Prince of Egypt, but for us Catholics, this is our story. Find the dog in you! When people mention the words unconditional love, only two images pop up in my head: Jesus and dogs. John Grogan’s New York Times bestselling book brought me to tears at the end of my reading because it reminded me so much of how human hearts don’t compare to the bottomless pit of love and devotion that this species from the animal kingdom unashamedly display, and how at one point in my life I had a pet dog who was my quiet emotional support during the challenging times I faced in the past. This autobiography of human and pet is a collection of side-splitting comedic entries and yet emotional journeys of the Grogan couple, and eventually, of the rest of the family. John and Jenny are both dog lovers whose childhood exposed them to saintly dogs…until they adopted Marley in their married life. John describes him as “wild as a banshee” but lovable as a mascot. Day in and day out, Marley’s wake of destruction in the house (and his being prime example of the dog NOT to be followed in obedience school) leaves them exhausted but grateful in that complicated way. 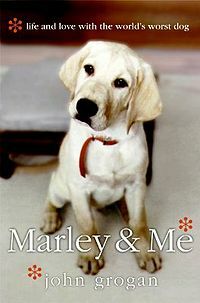 The dog is unstoppable in providing them public embarrassment, but Marley proves to be a loving companion in Jenny’s depression after her miscarriage, and in John’s emotional journeys in planning his family’s future. Marley loves the Grogan kids namely Patrick, Conor, and Colleen, and altogether they make a happy bunch of playmates and friends. The life span of dogs are very limited though, and as Marley aged, John and Jenny’s hardest challenge was to face the inevitable fact of putting him to sleep because of the tummy sickness that his already frail body was causing him to suffer. Marley taught me about living each day with unbridled exuberance and joy, about seizing the moment and following your heart. He taught me to appreciate the simple things–a walk in the woods, a fresh snowfall, a nap in the shaft of winter sunlight. and as he grew old and achy, he taught me about optimism in the face of adversity. Mostly, he taught me about friendship and selflessness and, above all else, unwavering loyalty. This is our family dog, Taffy. 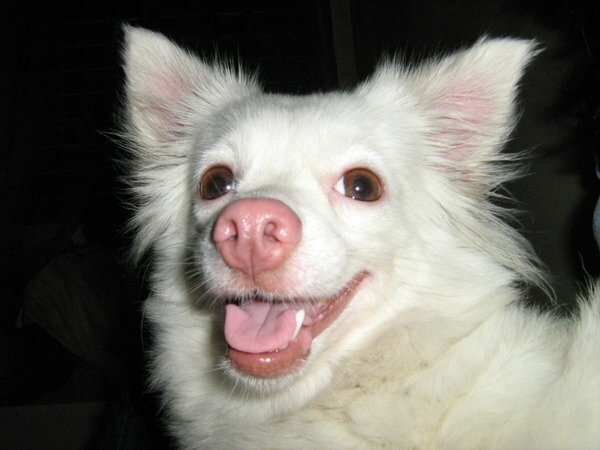 She’s a Japanese spitz who has a pink nose and brown eyes instead of black and was gifted to my sister sometime in 2006. She’s friendly and hyperactive, and friends have tagged her as the house’s ‘welcoming committee’ because she excitedly waits by the door when she hears visitors approach the gate. You need to pat her and take notice before she calms down or else she’ll jump on your lap until you do so! It was difficult to potty train her, but she’s nice enough to not pee or poo on our beds when she wants some cuddles with her masters. 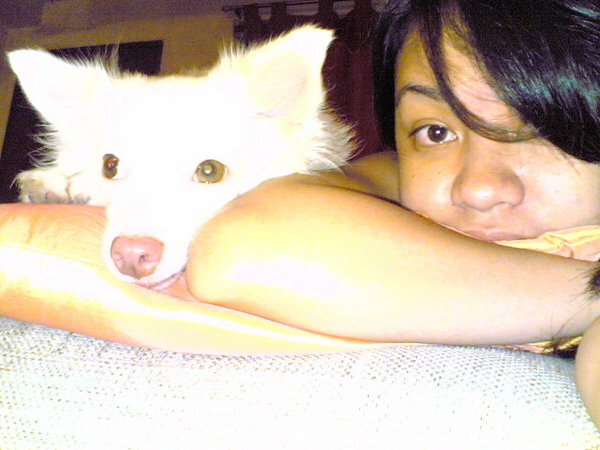 She’s really very sweet, and when I’m sad or lonely she’ll stay beside me until I actually throw her away from the bed. 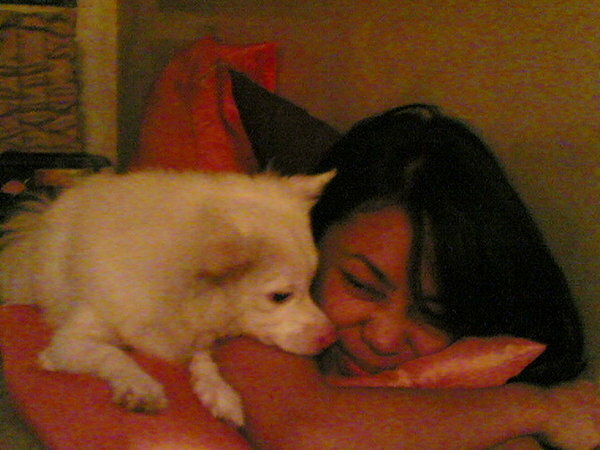 Sometimes, she licks away my tears (and the salt must be a very tasty sorta drink). She's giving me a kiss! I’m excited to see the movie. Friends who’ve seen it told me they were bawling like babies after the film. Am going to find a copy on Easter Sunday, and I’ll make my niece watch it with me as we “ooh” and “aww” with how cute the Labrador in the movie is. Sigh. 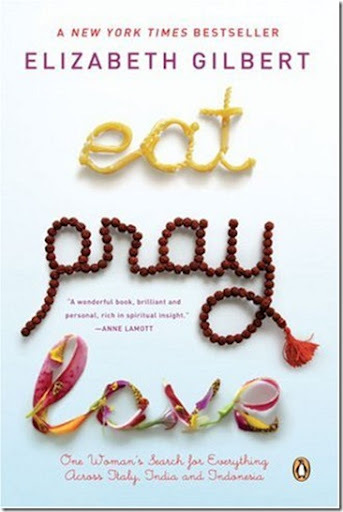 This book, which I bought on a summer sale for only Php 75, is a gem. It brings back a lot of good memories of my dog, Taffy, and it reminds me how encounters like these with the canine kingdom inspire me to believe in the purity and goodness of love in this crazy world. God made dogs to be our loving and loyal companions, protectors of our home, and source of entertainment. Dogs show us the limitless, boundless type of love, and this book shows you concretely a kind of beauty that endures in the finitude that is life. 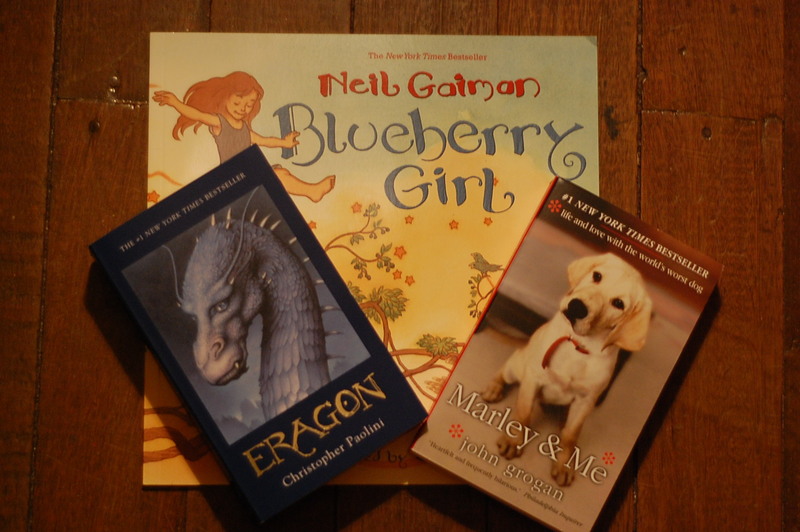 My summer sale books: Marley & Me is only Php 75, and Eragon & Blueberry Girl are 20% off. I don’t have a picture of the Fringe graphic novel and Clockwork Prince that my sister bought. Was looking for Sandman volumes, but they are nowhere to be found!